Glasgow City began the defence of the Premier League Cup with a 2-0 win over Hibernian, their opponents in last season’s final. This much awaited Cup tie attracted a strong crowd at Glasgow Green and City did not take long in showing their intentions when Sue Lappin headed against the cross bar on three minutes. A string of quick successive corners followed, but City were unable to open the scoring against a dogged Hibernian who were working very hard in defence. City dominated possession throughout the opening period, with Hibernian’s first effort coming as late as 28 minutes into the match. However, despite all of the play, City were unable to break down a determined Hibs. Jane Ross was the next City player to come inches away from breaking the deadlock when she fired a bullet header towards goal from a Leanne Ross cross, only to see her effort cannon off the post with Shannon Lynn in the Hibs goal beaten. 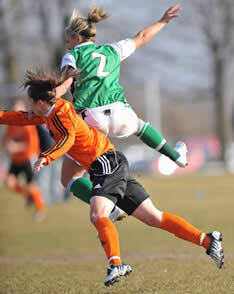 Eilish McSorley then had a header cleared off the line. The visitors defended a City corner only as far as City full back Leanne Campbell who sent the ball back into the box, which McSorley flashed towards the back post where it was headed off the line. 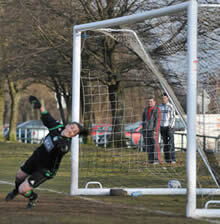 Jane Ross then broke clear in the Hibs box, but her right foot shot was well saved by Lynn in the Hibernian nets. Lappin then came close once more to opening the scoring. Getting on to the end of a long City throw, Lappin headed to the back post to team mate Rachel Corsie, who played it back to Lappin who smashed her effort over the bar. 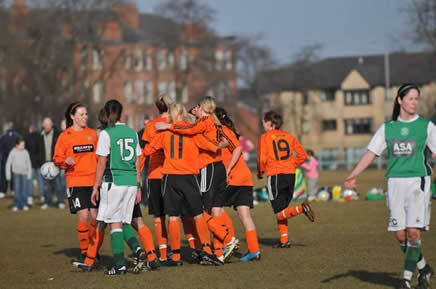 Jane Ross then hit a City corner straight on to the Hibs cross bar, with the ball moving away to safety. City striker Lisa Evans then thought she had made the breakthrough but her volley was saved by Lynn in the Hibernian goal. 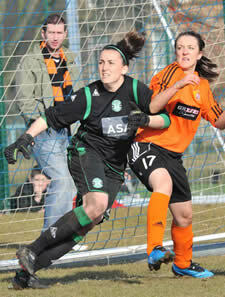 It was a great save by the Hibernian keeper in a match where she was proving to be in fine form for the visitors. The deadlock was eventually broken when Jane Ross powered into the Hibernian box only to be felled by Suzy Robertson and the Referee pointed to the spot. 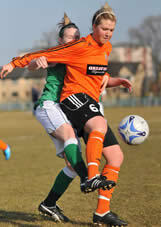 Up stepped midfielder Leanne Ross to coolly stroke the ball past Lynn to make it 1-0 to City. With only a few minutes remaining City striker Katharina Lindner gave City a two goal lead when she hit a brilliant twenty yard effort into the top corner.